A warm, comforting Dal Tadka, or lentils with a tempering of spices that's perfect food as the weather cools down. This is a creamy, comforting dish with the warmth of garlic and spices and the pleasant tanginess of tomatoes. Combine, wash and cook the lentils with the turmeric, preferably in a pressure cooker. If cooking on a stovetop, cover with an inch of water, bring to a boil, slap on a lid, keep on the lowest setting for the lentils to just simmer, and cook for 30-45 minutes or until the lentils are really soft and easily mushed up. Add more water during the cooking if necessary. Add the mustard seeds, red chillies and asafetida. When the mustard seeds crackle and sputter, add the garlic and stir-fry until the garlic browns. Don't let it burn-- stir constantly. Add the tomato and cook for a few minutes or until the tomato breaks down. Add the lentils and water, if needed. You want the dal to be runny but not too watery. This is a matter of personal preference, though, so if you like your dals thick, feel free to use less water. Keep in mind that dals do thicken on standing. Bring the lentils to a boil and let them cook for a few minutes. Add the sugar and salt and aamchur and stir to mix. Add the coriander leaves, mix well, and turn off the heat. 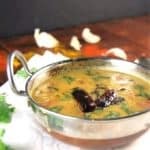 Serve hot with rice or parathas or roti.